Russian Foreign Minister Sergei Lavrov attends a news conference in Moscow, Russia, Feb. 7, 2017. Russia is to host a pan-Kurdish conference Wednesday, and among those invited to attend are members of the Syrian Kurdish group the PYD. Syria's neighbor, Turkey, calls the PYD terrorists, alleging they are affiliated with the Kurdistan Workers Party, or PKK, which is fighting the Turkish state. Turkey accuses the PYD of being an extension of the PKK, and claims the PYD is seeking to carve out an independent state along its border. Earlier, Russian Foreign Minister Sergei Lavrov invited the PYD to Moscow for a briefing on January's meeting in Kazakhstan about ending the civil war in Syria. Ankara blocked the PYD's participation in that meeting and in United Nations-backed Syria peace talks in Geneva. “If Russia is seen by Ankara as having decided to fully invest with the PYD, that certainly has the potential to very much undermine the overall outlook toward Moscow,” said visiting scholar Sinan Ulgen of Carnegie Europe in Brussels. Turkey has so far voiced little public criticism of Russia. Some experts suggest the reason could be that Lavrov's invitation to the PYD may have been in exchange for Moscow acquiescing to Ankara's demand for the PYD to be excluded from the Kazakhstan talks. Last week, a PYD affiliate opened a bureau in the Russian capital, in a move that analysts say is likely to add to Ankara's angst. Moscow also is pushing for a decentralized state in a future Syrian settlement, a stance strongly opposed by Ankara, which fears an autonomous Kurdish state on its border would lead to similar demands from its restive Kurds. There have been recent rapprochement efforts between Moscow and Ankara after a Turkish jet downed a Russian fighter operating from Syria in November 2015. 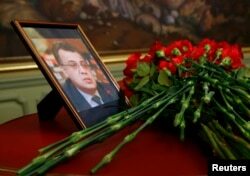 Flowers are placed near a portrait of assassinated Russian ambassador to Turkey Andrei Karlov during a meeting of Russian Foreign Minister Sergei Lavrov with his Turkish counterpart Mevlut Cavusoglu in Moscow, Russia, Dec. 20, 2016. Turkish leaders are normally vocal on any move by another country deemed supportive of the PYD. Russia and Turkey are cooperating on a cease-fire in Syria, efforts perceived in Ankara as enhancing its regional standing. Analysts say Moscow values Ankara's influence over Syrian rebels being a main supply route as well as supporter. Experts say Turkey also sees its deepening relations with Russia as providing leverage over Turkey's Western allies. Moscow chose to continue its rapprochement despite the December assassination of its ambassador to Turkey, Andrei Karlov, in Ankara. Regional experts say Moscow could be biding its time. Moscow sent its own investigators to liaise with their Turkish counterparts in the probe over Karlov's assassination. Skepticism continues to surround Ankara's explanation that the killer was connected to followers of U.S.-based cleric Fethullah Gulen, whom Turkey blames for a failed coup last July. Turkish-Russian relations were dealt another setback Thursday when a Russian airstrike killed three Turkish soldiers in what Ankara accepted as a friendly fire incident in fighting Islamic State for control of the Syrian town of al-Bab. IS extremists seized control of al-Bab in 2014 as part of a large offensive in northern Syria and neighboring Iraq aimed at establishing an Islamic caliphate. Turkey's pro-government media showed rare restraint, offering little criticism of the incident. Turkey's President Recep Tayyip Erdogan addresses local administrators, in Ankara, Feb. 8, 2017. Ankara for now appears ready to continue its courtship of Moscow. Analysts warn that the Russian stance toward the Syrian Kurds underscores the fact that the Turkey-Russia relationship is increasingly not one of equals and that Turkey may be making a series of missteps. Turkish President Recep Tayyip Erdogan is scheduled to visit Russia next month.